Clear all jellies and reach 33000 points complete the level. 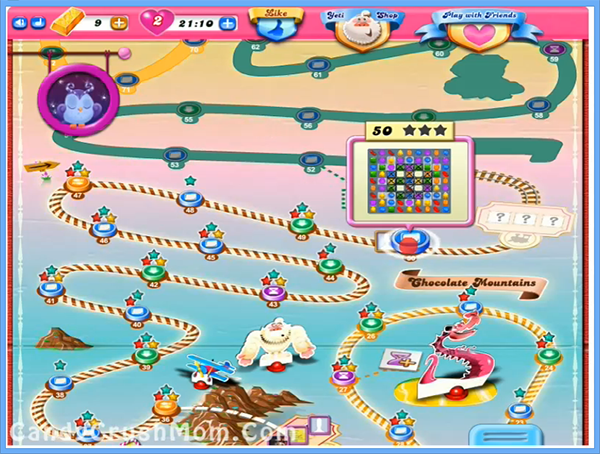 This is the last level of chocolate mountains episode and one of the hardest level as the candy board have some grill boxes that are not easy to break. To reach requirement you need to play little bit tricky and first try to break grill boxes when you get chance or make moves that help to make special candies and then break it near grill boxes or jellies. You should not waste any moves and get special candies like colorbomb that you can make by combining five same color candies or striped by combing four same color candies or any other and try to combine with each other to break more candies. We completed this level with 106980 score by trying more on getting special candies or making moves that are more near to grill boxes or jellies.